Sorry, Zeppelin Cocktail Shaker is not currently available. Glass bottle with wire-netting and a cover made in the early 1970s. A very unusual set of three silver-plated cocktail shakers. 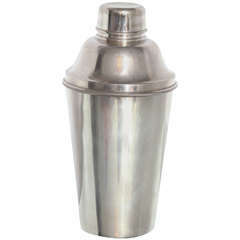 Made by Mappin & Webb, circa 1940 Measures: Heights are 25cm, 23cm and 19cm Capacities are 2 pints, 1.5 pints and 1 pint.